To every thing there is a season. A time to deceive and a time to expose the deceivers. The run up to Christmas and the New Year is often the best time for certain scams and deceptions. Maybe it’s because we all go slightly mad at Christmas or maybe it’s the sense of a new year approaching, I don’t know. There are certainly some scams that rely on a seasonal business cycle. The most obvious example is the telephone directory. I don’t mean the one we get from BTC or the local printed competitors, they’re legitimate (if often inaccurate). I mean the online directories that always, in my experience, are either scams or deceptions. The World Business Guide is probably now a well-known scam. This organization with the grand-sounding name is in fact nothing grand at all. They advertise via email this time of year, offering to place your company details in their directory which they claim is available on CD as well as online. The email asks that you complete a form with your company details and email or fax it to them. The introduction says clearly and in bold capital letters “UPDATING IS FREE OF CHARGE”. What they’re hoping is that people will misunderstand the word “updating” and will think it means “submitting” or “informing”. What they actually mean is that once your details have been inserted into their directory any subsequent updates or changes are free. What they mean is “corrections” are free. Once you make the mistake of sending them the form with your company details you’re trapped. You’ll then be bombarded with invoices, repeat invoices, follow-up invoices, aggressive emails and even lawyer’s letters from the World Business Guide demanding that hidden €995. They’ll ignore anything you say about it being a mistake by you or a deceptive practice by them and insist you pay up. Although the vast majority of the victims refuse to submit a small proportion do eventually pay up. It only takes a few companies to cough up the money and they’re in profit. The sad irony is that even those victims who were bullied into paying needn’t have done so. No company has EVER been sued by the crooks that run the World Business Guide. Not once, it’s a bluff. Nobody needs to pay. There’s also some confusion about where these crooks operate. Their web site says they’re based in Spain and the Netherlands but elsewhere they say they’re “a corporation organized and existing under the laws of BVI”. “BVI” means the British Virgin Islands, an offshore financial centre with a rather relaxed attitude towards shady characters. The ridiculous “University of SouthCentral Los Angeles”, a fake university that threatened to sue us a couple of years ago was also based there. There’s also a more important question about the World Business Guide. Who actually uses it? Ask yourself, have YOU ever used an online directory? I know I’ve used the online BTC directory once or twice but that was such a ghastly experience that I gave up (particularly as the link to their directory on the BTC web site is currently incorrect so it doesn’t work anyway). I’m not sure that anyone uses online directories, even the local ones. We’ve had several readers get in touch about a local directory calling itself the “SADC Yellow Pages”. On other occasions it’s called itself both "Yellow Pages Botswana" or "Business Directories Botswana" but whatever they call themselves they raise suspicions. To begin with, like the World Business Guide, they seem to have adopted slightly shady tactics. I got a series of calls at our office myself from them over the last few weeks. When I finally spoke to them they invited me to “update” our entry in their directory. There’s that word again, “update”. I told them that we didn’t already have an entry but they said they had put us in the “Business Training” section of their directory last year for free. That was a lie. We are not in their directory, we never have been, they don’t have a “Business Training” section in their directory and they were lying about “updating” it. They seem to be another online directory that’s deceptive. Also, something that’s curious about these people is that they too seem a little unclear about the truth. How can they claim they had my company details online last year when they were only registered as a company in South Africa last September? Sounds a little fishy to me. My suggestion is to give these directories a miss. I can’t think of anything that you actually get for the significant sums of money they want you to pay, they behave in a fashion that can charitably be described as suspicious and I’m sure you can think of a better way to spend a few thousand Pula on in the run-up to Christmas, can’t you? Like a Christmas party for instance. Don’t forget our invitation! There is a company calling itself SADC Yellow Pages. Someone calls from South Africa with the details of the manager. What they will then request is to do you a free artwork to see if you will be interested in placing your company in the directory. The person insists that they fax you the request for a free artwork form while you hold. As you do that, she tells you to sign at the bottom and fax it back to her. You are then promised to be sent the artwork for proof reading. The next time you will receive an invoice. The last time they did it they used the name SADC Directories. They have now returned calling themselves SADC Yellow Pages. We’ve had a number of people contact us about this company and we even got several calls from them ourselves. They called themselves "Yellow Pages Botswana" or "Business Directories Botswana" or "SADC Yellow Pages". I eventually spoke to their representative who asked if I was interested in "updating" our entry in their directory. "But we don't have one", I told her. "Yes, you do, we put you in for free, under Business Training", she said. She was wrong, there is no "Business Training" section in their online directory. So the offer of an "update" qualifies is either a mistake or a lie, surely? I thought the most interesting thing was that they didn’t know my full name, they just called me “Richard H”. The other curious thing is that they claimed we had an entry in their directory last year. How can that be when the company called “SADC Yellow Pages” was only registered in South Africa on 15th September 2010? "The agreement shall commence on the date of signature and remain in force for a period of one year. Thereafter the agreement shall continue for an indefinite period unless notice is given one month prior to the expiry of the initial period." I think that this is deceptive but let's be charitable, maybe they're just mistaken when they claim companies have existing entries that can be updated? And anyway, who ever actually looks at an online directory? Do you? My suggestion is simple. Tell them that you’re not interested and that they shouldn’t ever call you again. I bought a bed in 2009 and paid for it in full before I took it. I then put it in storage until I moved into my own house this year in August. This was when I unwrapped the bed to sleep on it only to find that the base of the bed is bigger than the mattress. I made the shop aware of this and they told me that the bed I had bought was no longer being made by the manufacturer and that I should go see them and choose a new bed, to replace the one I had bought. Today I went to view the beds and they want me to pay the difference of P1,000, between the bed I had bought and the one they are replacing it with. I really don’t know if this is the right way to go about it, I just wanted to know if I should incur the extra charges that arose. I suspect there's not much you can do with this situation. When you buy something you have a reasonable chance to check that it’s correct and if not the store has an obligation to fix the problem if they caused the mix-up. Unfortunately you surely have to do this within a reasonable time and waiting for 2 years and then expecting the store to fix the problem is asking too much. In fact by offering you a deal like this I suspect you’re being treated pretty fairly by the store. Well it's simple really. There IS no "CIB Financial Services" registered as a company in the UK. Nor is there such a company registered in South Africa. I phoned "Brenda Adams" and she couldn't give me a land line number for this "financial services company". When I pointed out that the company does actually exist she just hung up on me. It's a scam. They are not legitimate. There's a very old English word for that I think. Bastards. A South African company called Cashflow Pro are doing presentations in Gabs at the moment. They claim that their business is in teaching people how to trade foreign exchange. They claim that they "can make between 10 and 30 percent of their investment every month". Of course this might be perfectly true, but I suspect not. If they're making so much money why do they want to share the idea with you and me? I'm not the only one who's suspicious. The South African Reserve Bank and the South African Police Commercial Crimes Unit are investigating the company and it's founder, Jabulani Ngcobo, is under scrutiny. Apparently he's making a bit too much money and very quickly. Too quickly to be legitimate? By the way, it costs P12,000 to join. "What do you consider to be the processes, divisions, policies, practices, and mental models/assumptions (culture) that support [organisation] in achieving its strategic objectives?" "WHAT ARE THE EMERGING REQUIREMENTS FROM KEY STAKEHOLDERS THAT YOU BELIEVE [organisation] SHOULD TAKE INTO CONSIDERATION WHEN DEVELOPING THEIR STRATEGY (trends, patterns and Key Driving Forces (KDF’s) in the environment?)" "I appreciate your comments. But our CURRENT REALITY is focused mainly on Major Current Concerns for the [organisation] across People, Processes and Systems. As a result of this 'SWOT analysis', the issues arising during inception and late operations would be discussed during the strategy session AFTER scoping of the strategic initiatives, Key Result Areas, measures and targets. Before such is established, the requirements for operations seem irrelevant as the initiatives are unknown. In addition, with the questionnaire providing answers of strengths, weaknesses, and performance indicators (KRAs) as from stakeholders, the [organisation] will develop initiatives that will enable them to maximize on strengths, minimize weaknesses and meet stakeholder needs." I sometimes think there should be a law outlawing the unnecessary and wasteful use of words. If confident people can be abused what chance do the less confident have? Last week I was in a store that can remain nameless but I’ll just say that it focuses on technology. Just as I was leaving a guy came in who I knew. He’s a successful self-made businessman and he’s tall, confident and sociable and is the sort of person you suspect is used to be treated properly. I know we’re all equal, both morally and before the law but people like him are probably less likely to be abused. Or so I thought. His situation was simple. He’d bought a printer two months ago but something had gone wrong so he took it back to the store for them to fix. So far so good. How can anything go wrong with this situation? His problem began when he confessed that he’d lost the receipt. That wasn’t actually a big issue for the store because they confessed, when he asked, that they could trace the purchase in their computer system. They didn’t deny that he’d made the purchase from them. The technician in charge of repair jobs told him that a problem WOULD arise when the company who actually did the repair received the printer. Apparently they wouldn’t even begin to repair it until they had the customer’s receipt, even though this was nothing to do with them. I can understand that the repair company wanted to know that this particular printer had, in fact, been sold and it wasn’t just the store trying to get something done for free, but surely the store could just provide a printout from their computer system or prove in some other way that it had been legitimately purchased? Surely the store manager could call the repair company and confirm that Mr X had indeed bought the printer on a certain date? Unfortunately the customer was told that until he could provide the receipt they simply would not help him. That’s when I found him, standing there, simply not understanding why they were being so difficult. He couldn’t understand why he couldn’t get his printer repaired when the store accepted he had bought it from them, that it had subsequently gone wrong and that it was covered by a warranty. It wasn’t surprising that he was begin to lose his cool. Being a bit of a busybody I tried to get involved but came up against exactly the same story. The repair guy wouldn’t budge until the missing receipt was found. Luckily a quick word with the manager led to a promise that he would intervene and see what pressure he could bring to bear. I’m sure that a little authority will make everyone see reason and get the printer fixed but why did it take that level of effort to get things moving? Also last week we had a complaint about a store’s refund policy. Despite their till slips clear saying that they will “gladly refund or exchange any item in a saleable condition within 60 days” when our reader actually took something back and asked for a refund she was told that only an exchange or a voucher was available. They didn’t do refunds, she was told. Of course this wasn’t true, whatever the people in the store might claim. The printed till slip made it perfectly clear what she was entitled to. It was in writing. No debate was necessary. As it happens this particular customer was perfectly happy with a voucher she could use some other time but the principle is what matters. A store can’t commit to something and then just change it’s mind. Luckily (and properly) when we contacted the head guy at this chain of stores he was quite straightforward. Of course the customer was entitled to a refund. The store would offer an exchange or a voucher but a refund would be available as well if that’s what the customer really wanted. There were exceptions but these had clearly been mentioned on the till slip. You can’t exchange underwear if it’s been worn (yuck) and cellphones were different but everything else was covered. The head guy said this was clearly a misunderstanding by that particular store. He assured us he would make sure they understood in future. But both these cases come back to one single question. Why do staff in stores like these think they can make stuff up? Why do they think they can make up rules as they go along? Why would the staff at the printer repair company think they could demand unreasonable things of customers and the store. That’s actually simple to answer. It’s the management’s fault for not making it clear to staff what can and can’t be done. They had no guidelines so they had to make them up. Another question. If the customers in both these cases, a man and a woman who were both confident, educated, intelligent, assertive and logical are treated this way, does that mean that anyone a little more meek just puts up with it and we don’t hear about their experiences? I suspect it does. I suspect that many people just accept whatever a store says, either because they don’t know their rights or because they’ve forgotten that the store is NOT the one in charge. The store is NOT the one who can decide by themselves what’s going to happen. Luckily in both these cases the management were reasonable and could see that things were going wrong and it was their job to fix the problem. It’s not always that good. Moagi Siele from Gaborone City Council who or reader says offered “the best service I’ve ever got from the public service”. Violet Mophuting from FNB Main Branch for going out of her way to help a customer. We got an email from a reader who also felt that the SADC Yellow Pages people were deceptive. We commented on them earlier this month. "There is a company calling itself SADC Yellow Pages. I suspect that this same company that once conned our company of some money. They get your information from your website or directory. Someone calls from South Africa with the details of the manager. What they will then request is to do you a free artwork to see if you will be interested in placing your company in the directory. The person insist that they fax you the request for a free artwork form while you hold. As you do that, she tells you to sign at the bottom and fax it back to her. You are then promised to be sent the artwork for proof reading. The next time you will receive an invoice. The last time they did it they used the name SADC Directories. They have now returned calling themselves SADC Yellow Pages." If this is how they operate then it certainly seems deceptive to me. Who else has been contacted by them? I bought a Toshiba laptop from Home Corp on 11th June 2011. Two months later I noticed that one of the keys had fallen off. I took the laptop together with the key back to the store as it was still under warranty, that was on 27th July . At the store the customer service rep told me that Toshiba didn't have a local agent so they had to send the laptop to SA for repairs a process he said would take 2 to 3 weeks. He also said he wasn't sure if the warranty covered the keys but I told him to go ahead as he said it wasn't going to cost more than P200/300. It has been six weeks and I still don't have my laptop back. Now all I am getting from them is one excuse after another whilst they are getting their installment in full every month. I feel that's grossly unfair. Please advise. We spoke to our friends at Home Corp and they have offered the customer another laptop to replace the one they sent to SA. They explained that they have problems getting repairs done locally for certain makes of laptop. That’s probably the lesson we can all learn from this situation. Make sure you buy high-tech equipment from a manufacturer that’s supported in Botswana. A pat on the back to the guys at Home Corp for fixing this when we got in touch. Well done to them. I bought a second hand Air con Compressor for my Car from a dealer in Tlokweng. I gave them P2,500 but he then gave me the wrong one. I returned it to him and he promised that he had the correct one and it also happened to be the wrong one. We both agreed that he must return the money. Up to now he still says he is still raising the money. It is now more than 2 weeks with this guy not paying me up and my car is stuck. What should I do ? Should I go there and sort this guy out because every day I really, I do really get p***ed off and agitated? Should I go there and take stuff to pay myself? I want my Money. I understand that you’re cross but please, whatever you do, don’t take the law into your own hands. That would make YOU the villain. I suggest you write him a letter giving him 7 days or you’ll go straight to the Small Claims Court. See if that works. Last week we reported on a complaint from a reader who had bought a laptop on credit from HiFi Corporation for her niece (I wish I had an aunt like her!). Luckily the credit agreement came with an insurance policy that she thought would cover her when the laptop recently exploded. Unfortunately the store’s initial response was that the policy didn’t cover “mechanical faults” which she thought was surprisingly. So did we. We contacted the store and they’ve fixed it. They told us that “the insurance claim has been approved”. Another pat on the back, this time for HiFi Corp. Well done to them. We had a complaint from someone who borrowed P500 from a micro-lender but although she had problems repaying the P500 she continued to repay the P150 interest each month. She was horrified to get a letter from attorneys demanding P1,000 for the lender and P691 for the attorneys. We spoke to the attorneys and suggested that she should NOT be required to pay anything at all until the lender could provide evidence that P1,000 was justified. We also asked how a private individual like this lender came to be running what seemed to be an unregistered micro-lending business. We wondered whether she was registered either with NBFIRA, who regulate such lenders and with BURS, with whom she should be registered and to whom she’s presumably paying tax on her profits? They couldn’t answer that. I also asked NBFIRA if they’d heard of the lender and it seems they’re on the case and have asked for a statement form her. Maybe I should tell BURS as well? On Facebook you'll see many links on the right side of your screen like this one. 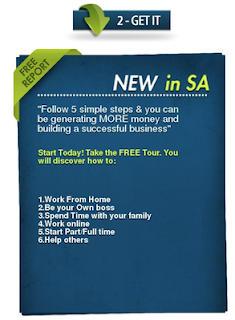 There are the usual hints about being your own boss, working from home and earnings lots of money without stress. The second step demands your name and email address. Once you've entered these details you're then presented with a web page containing 9,617 words that does not, not even once, say what this "successful business" opportunity actually is. It doesn't take too much digging to find out what this is really about. The Facebook "Info" page gives a clue. The link goes to a site offering more untold riches that again neglects to give even the slightest clue about what the business actually is. However it does include a number of testimonials from supposedly successful members of whatever this scheme might be. However, it's curious that our friend "Moela Chiloane" appears to have said exactly the same thing about a variety of schemes, not just this one. 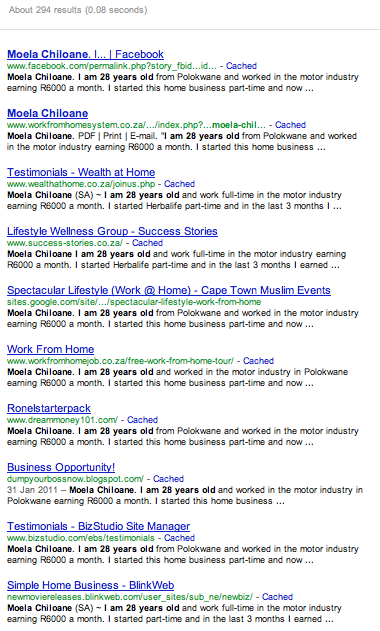 A Google search for "Moela Chiloane" and "I am 28 years old" finds 294 different web sites. A promise of overnight success"
but who then proceed to offer examples of various other people who have made fortunes with very little work. People who it must be said don't actually seem to exist other than on this and similar sites. The truth behind all of this seems to be quite simple. The founder of this "Elite Business Systems", Shawn Lewis, wants you to pay R297 for the "Elite Business Systems Starter Pack". But what is the business behind all of this? Is it a pyramid scheme? No. From what I can gather it's nothing more than Herbalife, hidden behind an enormous amount of marketing hogwash. My feelings about all of this? If this system is so successful why aren't they just open and honest about what this all is? Why the deception? Why the lies? "A friend has been offered a job in UK via the internet. They were looking for someone who knows the business of taking care of the elderly. The one offering her a job said there were a lot of support workers in UK but none of them were willing to live and work full time and this prompted the need to look for a foreigner. My friend accepted the offer and they said she should pay £300 and they will contribute £4,000. They also said they will be responsible for flight ticket. I am not sure if this is really a job or something else. How can I know if this is a job. At this moment my friend has not paid that sum because she is still looking for it. There are various clues. Firstly the UK has VERY strict rules about foreigners going to work in the UK unless they have very specialist skills. A care worker for the elderly is certainly not in that category. Those rules give preference to UK and European Union citizens first and only then do they consider non-EU citizens. 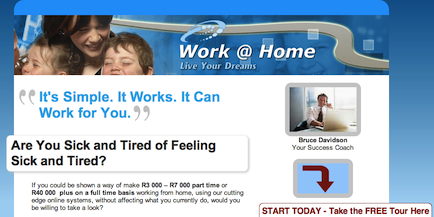 Given that currently over 2.5 million Brits are unemployed they're not going to recruit people from Botswana. Secondly, the address is wrong. The postcode "L32 7GH" is in Liverpool, not London and there's no trace of a "97A Berkshire Court Estate" anywhere in the UK and the only trace I can find of "Arvin Wollen" are on classified ad sites in far-flung places. The final clue is the "advance fee" that he's demanding, the £300. That's what this is all about. It's a scam, there's no doubt about it. There's a "romantic advance fee" scammer on the scene currently calling himself "Best Moore". He has a Facebook page under that name but also calls himself "Gleen" by which I think means "Glen". He claims to be an American working in London but that's not true. He's a scammer. Obviously the picture he's chosen isn't him, it's one he's stolen from somewhere. After befriending a woman from Facebook he'll eventually claim that he's sending a package using a shipping company called Global Cargo Alliance in Malaysia. While this company is genuine they have no branches in Malaysia. I know this because they've issued a warning on their web site about it. This fake shipping company will want payment of $670 before they release the package and guess what? They want paying using Western Union. We spoke to the head guy at Woolworths following the problems with refunds. He assured us that this was a misunderstanding and that with certain normal exceptions customers are, of course, entitled to a refund if they don't want either an exchange or a voucher to spend later. I’ve spent the last few days trying to resist the temptation to write about the life of Steve Jobs, the co-founder of Apple, who died last week. I’ve tried hard but I can’t resist it. I thought of writing about my passion for Apple products, about the overwhelming level of innovation Apple seems to possess and about how utterly, completely and staggeringly cool Apple products are. But everyone else has done that already. And anyway, I was beginning to get a little overwhelmed by the sheer level of nauseating hero worship the tech world was giving him. My problem is that I don’t think Steve was a hero and I don’t think he saw himself as heroic either. What Steve Jobs was so good at was leading an incredibly talented team of people. I think that real heroes are slightly different. All of my heroes are people who fought, often alone, and against their peers to achieve things. Heroes like Churchill, Gandhi and Mandela all fought against their own people as much as they did their opponents. Churchill fought hard in Britain to keep his nation fighting the Nazis, Mandela fought to achieve reconciliation rather than the (frankly understandable) desire for retribution and Gandhi was one of the few voices against violence during the partition of India. Steve Jobs was never faced with such a situation. He had his conflicts with the management of Apple at one point, so much so that he was fired by the board of Apple. A few years later he was back, but only after founding NeXT, which changed the IT industry, and Pixar which gave us some of the best animated feature films of all time and he then managed to turn Apple into one of the most valuable and best loved brands in history. However, what I think was special about Steve was his abilities as a leader. When I listen to his speeches and presentations I genuinely get the impression that he was proud to be the leader of a team of extremely talented people. One of the most popular speeches he gave was the now famous “Stanford speech” when he addressed the students at Stanford (text here). This has now been seen by over 11 million viewers on YouTube. However, I prefer another clip that’s only been seen by a mere 400,000 people. On YouTube search for the “Steve Jobs Insult Response”. On various occasions in the speech he spoke with enormous pride about his team, naming them and saying how hard they were working and how they needed support as they “work their butts off”. I think the difference between Steve Jobs and a lot of other CEOs, particularly those in the technology business is that I genuinely think he meant it. You can certainly see that in the products Apple have produced. Of course no product, even an Apple product, is perfect but here’s a personal example. The laptop I’m using to type this is almost exactly 3 years old. At no point in those 3 years has it crashed. Not once. Not once has the laptop itself failed me. I think that’s probably down to the attention to detail for which Apple is famous. Much of that came from the top. A CEO that concerns himself with details that small and on behalf of an entirely different company is the CEO of a company whose products you can rely on. So, please, no hero worship of Steve Jobs, just massive admiration for someone who had enormous attention to detail, offered inspirational leadership and had an overwhelming concern for the customer experience. He’ll be missed but he’s left a legacy that I know will live on for a very long time. Stupid FedEx scam. How stupid do scammers get? In respect to your email, I have been awaiting for you to contact me for the delivery of your bank draft of $850,000,00 from United Nations Sponsored by Commonwealth for development in your region. All you need to do right now to get your draft delivered to your door step is to go ahead and pay the security keeping fee of the courier company so far.The fee is $185.00 USD only, you are to come up with this fee as to process the delivery of your package to your Home address. Charges must be paid before delivery to your home address. 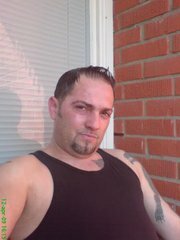 FedEx Officers Name: William cole. Address: 9, Airport road, Benin City, Edo State. Text Question to be used: What is my favourite colour? Text question and answer (use above). Get back to me with your payment details/western union receipt. Note that your tracking number will be provided to you as soon as the payment have been made and confirmed by us. The picture is actually a real one taken from the FedEx web page, of David F. Rebholz, who rejoices in the title of "President, Chief Executive Officer, FedEx Ground". Needless to say the scam has nothing to do with either FedEx or him. I purchased a laptop computer for my niece in July 2009 on hire purchase. She is a student in South Africa and required it for school work. In June 2011 the computer exploded when switched on but surprisingly it was not plugged to the power point in the room. The matter was reported to the store who required us to bring an affidavit which we gave them later in June when my niece was home. The shop staff attending to us then informed us that the affidavit should have been made by me as I made the original purchase and paid the installments so I did this in July. Last week the store informed us on 6 October 2011 that the Insurance cover could not be extended on mechanical faults. We appeal to you for assistance on this matter as we argued that part of the cost for which we pay installments covered the insurance for eventualities such as the equipment catching fire and is rendered unusable. I other words, the insurance should cover it. This depends entirely on what the insurance cover policy says but I’d be intrigued to see an insurance policy that excludes the laptop going wrong. It’s probably a completely different matter but I checked the store’s web site and it explains the warranty they offer. Some of the terms are bizarre to say the least. For instance their warranty won’t cover “any defect arising out of the design of the appliance”. So if the laptop was designed badly it’s not their fault? I think not. Anyway, we’ll get in touch with the store and see if they can come up with a solution. I am so confused and stressed and kindly need your help and advice. On the 1st of June I borrowed P500 from a certain lady. The amount was to accumulate by 30% interest every month till my final settlement. I agreed to pay it by end of June in full as I expected a payment somewhere but till today I never got paid, but I tried to at least to pay P150 interest every month till I settle. To my surprise the lady sent me a text demanding the full amount sometimes around the 15th of August and I did not reply the message. On the 29th of August I gave her P150, and on the 29th of September I went to give her another 150 and she refused to take it. Yesterday when I went to collect my post I found a letter from her attorneys demanding P1,000 for her and P691.20 for themselves in 7 days or they will issue a summons. The letter was dated 7th of September 2011 and it states that I failed, refused and or neglected to pay as agreed or at all but I’m not refusing to pay, I do not have the full amount for now but I am willing to pay. Please help me what are my rights and what should I do. I’m very suspicious about this. Firstly, I wonder if the lender is registered with NBFIRA? When we got in touch with the reader she confirmed that the lender was an individual, not a company. I wonder therefore how she can be charging interest on a loan like this. You’d think that the law firm would know about this, wouldn’t you? Also I think it’s very important to make it clear to the attorneys that they are acting on incorrect advice from the lender. You haven’t “failed, refused or neglected” to repay the loan, you’ve been doing your best in the circumstances. We’ll speak to the attorneys on your behalf and suggest they go back to their client and straighten things out a bit. My copy of the Oxford Quick Reference Dictionary defines the verb "refund" as "pay back (money or expenses)". Another defines the noun as "a repayment of a sum of money". "We will gladly refund or exchange any item in a saleable condition within 60 days, provided you have the original till slip." However when customers in Botswana take items back they are told that the offer of a "refund" only applies in South Africa, not in Botswana and that we have to live with either a voucher or exchange instead. No, sorry, the policy is what Woolworths have put in writing and given to the customer, not something else they've decided and not told customers BEFORE they complete the transaction. obligations, or remedies of a party to a transaction"
We've spoken to Woolworths today and did they say they're going to start honouring their own policy? No, on the contrary, they say they're just going to change their till receipts to offer us a lower level of service than our South African cousins. I receive this kind of message on many occasions. How are you today, Hope all is well with you and your family? You clearly know this is a scam, don’t you? All the signs are there, the free email address, the email from the blue, the unbelievable nature of the email and the fact that they don’t know your name. People don’t just spontaneously get in touch and offer total strangers vast quantities of cash. It just doesn’t happen. My suggestion is either to delete the email immediately or reply and tell this guy where he can stick his scam. Please also tell him we’re not that gullible in Botswana and that he should get a real job. Don’t feel the need to be polite. You are wrong i was directed by ( My boss Mr Andy Dozie) to send the $850,000 USD and the money has been issued on cheque . Let me have your address where you want to receive the cheque also your tel number is needed. As soon as i receive the information i will go to any courier delivery company and deliver the cheque to you. If you feel like having some fun why don't you email "Nelson" and tell him what you think of him? I’m sorry to be rude. OK, perhaps I’m not. Sometimes I’m afraid that my reactions are just spontaneously rude. There are times when “stupid” just seems to be exactly the right word to describe the situations I’ve encountered. We heard from a consumer recently who bought an item of clothing at a well-known store. Unfortunately she made the mistake of buying the item without actually trying it on first. OK, we’ve probably all done that so we can forgive her the oversight. Anyway, she had reason to expect the store to fix it. On the back of the receipt it clearly stated that the store offered an exchange or a refund. Clearly a good store, one you can trust to be intelligent and not stupid. However, it wasn’t that simple. She went back to the store to get the promised refund or exchange but you can imagine her shock when they said they only offered exchanges or vouchers and not refunds. She directed the store’s attention to the receipt that she had so wisely kept but was told that that only referred to South Africa. No, this wasn’t stated on the receipt. When she wisely demanded to see the manager he told her that it hadn’t been their job to explain that what was written on the receipt had been untrue. “You should have asked”, she was told. You don’t need me to tell you that this is stupid, utterly stupid, do you? They gave her a written guarantee that a refund was available but then denied it? Can you imagine how much a judge would laugh if he or she heard that? See if you can see the logical flaw (or just stupidity) in another story I heard recently. Cahoot, the internet division of Santander, one of Europe’s largest banks, emailed a number of it’s clients asking them to confirm, guess what, their email addresses. Understandably many of the customers were suspicious, thinking this was a “phishing” attempt but no, the bank do seem to be as stupid as it seems. Needless to say Cahoot is now the laughing stock of the European banking industry. What about the stupidity of scammers? Does anyone object if I call them stupid? How can you object? Crooks don’t deserve the respect you and I would pay each other. Recently we’ve been researching what seems to be a new kind of scam. It’s not the usual “my father died and left me a fortune and I need your help to get the money our of my war-torn country” scam. This is more complex. In fact, I don’t even know how the scam works but trust me, it is one. A reader got in touch to ask if we could help investigate a charitable foundation he was thinking of dealing with. They call themselves the "Fundación Donaciones Humanitarias" which, given my extensive knowledge of Spanish (and the Google Translate facility) means the “Humanitarian Grants Foundation”. They claim to be "a humanitarian foundation connected synergistically to multiple non-profit and profit activities and organizations aiming to achieve our mission" whatever the hell that means. As proof of their existence they sent our reader a copy of a letter he was told had been submitted to the South African Government offering them a grant (not a loan) of, get this, US$800 billion. No, not millions, BILLIONS. That’s more than the entire GDP of South Africa. It's roughly P5 TRILLION. The staggering amount of money is enough of a clue that this is bogus. Couple that with free email addresses, cell numbers and there being no evidence of them ever donating anything to anyone and you'll understand why I'm suspicious. They claim to be "affiliated" with the United Nations but I can't find any trace of that either. Nor can I find any confirmation of their emailed claim that "Interpol cleared the persons involved and also FDH". No, Interpol DO NOT "clear" companies, that's just another lie. However, here's the interesting bit. The person who wrote the letter offering this fortune is a real individual. I know, I've spoken to him. He is traceable. He runs a small business in South Africa. The person who seems to be behind this scam calls himself “Sir Edward Cooper” and he really exists too. Well, there is a human being calling himself that name but that’s all a lie. There’s as much evidence that he exists as there is for FDH. When I spoke to “Sir Edward” all the way from Hawaii he claimed initially that his knighthood had been awarded by Queen Elizabeth but when I pointed out that she’s never knighted anyone with that name he became a bit more slippery, claiming it’s a Hawaiian knighthood. No, there’s no such thing as that either. As I said I don’t know yet where the scam is here but there is evidence that “Sir Edward” was connected with a previous scam donor called the “Pureheart Foundation” that seemed to operate in the same way. So isn’t “Sir Edward” a clever guy for running such a complex scam and for creating these fake identities? No. If I can expose him with minutes he’s clearly pretty stupid like all the other scammers. The manager at Spar at Kgale Shopping Centre. Our reader says he’s the one with “the piercing blue eyes”! I am a tenant and my landlord has given me a week notice to leave his house, Can you please help? I have not yet found a house to rent and people are already moving into the house? This isn’t acceptable. The reader later told us that she had a 2-year lease for the property and yes, hidden away in it was a terminations clause saying that both the tenant and the landlord had to give a month’s notice of termination. Even then the landlord would need to go to court to evict a tenant who refused to leave. We told her that she should write the landlord a letter demanding that he respect the terms of the lease and give her a full month to vacate. And he needs to do it in writing, OK? Thank you for your service to us consumers. I bought something from a major store without trying it on first, unfortunately when I got home it didn’t fit. When I tried to return it, they said they could only offer an exchange or vouchers (which I think are just another form of an exchange). I showed them that on the back of their receipt said I could exchange or get a refund, but they said that referred to South Africa and their store policy was that they do not give refunds. So I said to the manager that that was the only policy I knew since they had nothing else written anywhere contrary to that, and he said I should have asked. I'd just like to know your take on that kind of situation. By the way, I actually have no problem with vouchers because I will definitely buy from this store again, but I just want to clear up whether or not they can have a no refunds policy, and especially if they can claim that the notices on the back of their receipts are meant for SA customers, but not for Batswana. I find that hard to believe. Please forgive my rudeness but some stores are just stupid. How stupid can it be for their receipts, the printed legal confirmation of the sale, to say that refunds are permitted but then deny it? Have they never seen their receipts? Can’t they imagine what a judge would say if he or she saw them? Send us the receipt and we’ll get in touch with the store. This one’s going to be fun! It's very frustrating to come in second place. For months I've been meaning to write about various colleges associated with the University of Wales. UOW is a perfectly respectable British university with an impressive history but in recent times it's allowed some rather dubious establishments to receive it's accreditation and approval. "will now award degrees only for courses it designs and fully controls"
At least UOW did something to protect it's reputation. Every year at this time the directory scammers come out to play. The World Business Guide is an obvious case of a scam but there are local slippery directories as well. We've been receiving phone calls from a company who sometimes call themselves "Yellow Pages Botswana" or "Business Directories Botswana" or "SADC Yellow Pages". I eventually spoke to their representative who asked if I was interested in "updating" our entry in their directory. "But we don't have one", I told her. "Yes, you do, we put you in for free, under Business Training", she said. She was wrong, there is no "Business Training" section. So the offer of an "update" qualifies is either a mistake or a lie, surely? "The agreement shall commence on the date of signature and remain in force for a period of one (1) year. Thereafter the agreement shall continue for an indefinite period unless notice is given one month prior to the expiry of the initial period." I think that this is deceptive but let's be charitable, maybe they're just mistaken when they claim companies have existing entries that can be updated? And anyway, who ever actually looks at an online directory? Do you? P.S. Take a look at their online directory. It takes skill to make a web site that horrible.